We all have times when we need that little bit of acoustic buffering during meetings, touchdowns or for that important phone call. At Think Furniture we have compiled a list of some of the best ranges in acoustic solution products on the market for your personal, meeting and office acoustic needs. Belgian designer Axel Enthoven was responsible for an ingenious look which harmoniously combines functionality and ergonomics. The swivel base, the built-in light source and the sidewalls provide extra privacy. During this years Orgatec Exhibition we were presented with the ideal personal acoustic solution in the form of the ID Trim Cap. ID Trim Cap gives a clear signal: Please do not disturb! Because its cap is sound-proof, ID Trim Cap is highly suitable for use in micro-concentration zones in open-plan offices. Another great personal solution is the Workshelter from Vitra. Defining a place of retreat for deliberation, concentration and solitary work. Workshelter’s worktop is screened by two felt-lined walls which isolate the user both visibly and physically. The felt lining is acoustically effective and not only protects the workstation within Workshelter from extraneous noise but also increases the sound absorption surface in the room. Workshelter, an important element of the Net ’n’ Nest concept, can be rearranged at any time. The Bouroullec brothers have designed several workplace solutions before for Vitra but this is almost a melding of both workplace and acoustic soft working area. As ever with Vitra the design aesthetic features highly but not at the cost of acoustic effectiveness.The Workbay offers a calm environment and sense of focus for more studious or intensive tasks. Design by Alain Gilles The BuzziHub is a space where people can easily come together and share information. It has been designed to become a central point in the social life of an office. The BuzziHub has been designed in order to make you feel at home. It is a warm and comfortable environment made to facilitate communication and improve personal wellbeing. 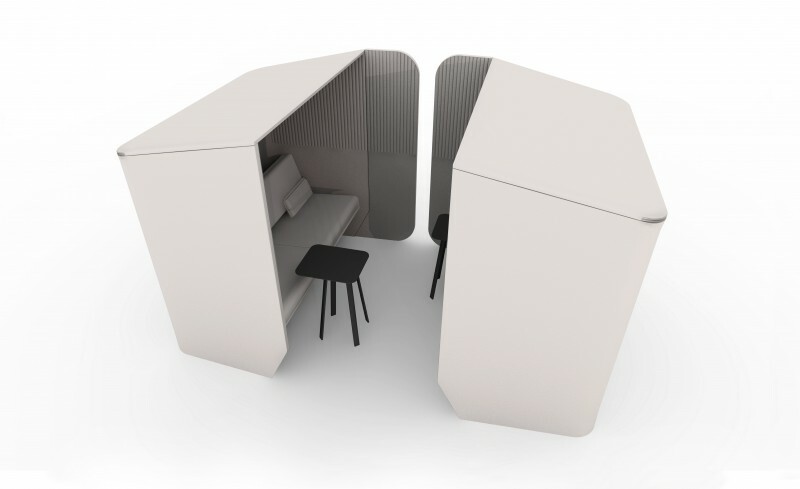 For the more flexible solution of personal space that transforms into meeting area we have the Orangebox Cove. This is a system that offers a combination of Screens , Tables and Seating. The Modular nature of Cove allows for a good selection of differing configurations to provide flexible workspace for various scenarios from touchdown space to resource centres. Cove's flexibility makes it perfect for changing or expanding environments. Easy to re-configure and add to ,the Cove system can be changed to suit modern work or study needs. Acoustic solutions sometimes need to be built into larger spaces for effective conferencing and meeting capabilities. Offecct fill this requirement with their visually stunning acoustic tiles, for large spaces where the acoustics have to be considered without compromising on style. Offecct acoustic tiles are available in a wide range of styles, colours and patterns. Aside from their excellent acoustic performance they provide for an interesting visual aspect. The need for sound absorption in public spaces is becoming more and more important. Window is a magazine display that works as a sound absorber or a sound absorber that works as a magazine display. It is pleasant to work in a quiet environment. A sound absorbing wall full of magazines provides relaxation for both the eye and the ear. Moulded felt is the basic material of Window. The material is recyclable, sound absorbent, lightweight and durable. Airflake is a sound absorbing screen made from moulded fibre felt. This modular system is built around the shape of a hexagon in a variety of designs and colours, which can be freely combined to create the screen. Moulded fibre felt panels in seven colours and four patterns. It can be fixed to aluminium rails for mounting on walls or ceilings. Airflake can also be fixed directly to the wall as a sound absorbing decoration.